When it comes to promoting or marketing your business, it is crucial that you make the right decisions. Most small to medium sized businesses don’t have the budget to tolerate failure in their promotional campaigns, which means that many firms will opt for the safe approach. This means it becomes more difficult to stand out from the crowd and achieve strong success with your promotional campaign. There is a way to choose a tried and tested marketing approach that provides you with the freedom to be expressive and innovative. If you are looking for a reliable marketing approach, which also sits neatly with the ever changing nature of internet and online marketing, the benefits of cartoon strips will provide you with everything you need. Of course I’ve been to college…. COMIC and CARTOON STRIPS add stickiness to web sites! 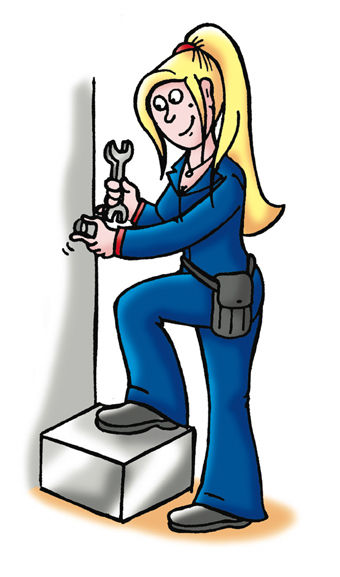 Triton is keen on the idea of having a female installer character which could be used to promote the growing trend of women in plumbing. Whether this would take the form of cartoon strips or whether we would look at going down another route I’m not yet sure but we are due to present the proposals to Triton next week and I thought it would be nice to go along to this meeting with a few visual sketches of Ed’s new friend. Do you think you could draw up a few ideas for me as you did with Ed in the first instance? These only need to be rough sketches to show what she looks like (I imagine her to be quite a tomboy and wearing overalls). When commissioning cartoons… Pick TWO of the three options! Good+Fast = Expensive Choose this and I’ll postpone every other project on my drawing board, my round of golf or give up my footy match ticket and work day and night to get your job done. It WILL NOT BE CHEAP though! Good+Cheap = Slow Choose good and cheap and I’ll still do a great job at a discounted price. But you’ll have to be patient while I fit you in after my higher paying clients, updating my web site, going down the gym, my footy matches, rounds of golf and liquid lunches! Fast+Cheap = Inferior Choose this option at your peril. It will still be delivered on time but it will be inferior, as many corners as possible will be cut. You know the saying ‘You get what you pay for!’ The least favorable option in my opinion!